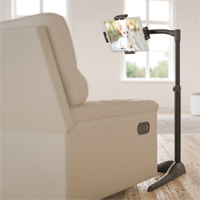 Reduces Strain and Fatigue - The design of the LEVO G2 Essential Tablet Stand allows the user to sit or lie comfortably in the most comfortable position. This eliminates hunching and will reduce strain in the back, neck, shoulders, and arms. Hands Free - No Need to Grip - The LEVO G2 Essential is able to hold most tablets firmly in place allowing both viewing and using the touch surface of the tablet to type, access information, surf the web, etc. Normally using a tablet requires the user to exert constant grip force to hold it securely while typing and using the touch surface. The G2 gives users a second set of hands, freeing both their hands for not only using the tablet, but other activities as well. Increases Overall Comfort - The versatile movements of the LEVO G2 Essential allow users to avoid any awkward positions. It also makes it possible for the user to choose the most comfortable posture. Effortless Storability - The user can easily move the G2 arm out of the way when temporarily leaving their G2 Essential tablet viewing setup, and quickly reproduce the position they were in upon their return as the tablet height and orientation are not impacted by the lateral arm movement.